If you’re anything like me, you have tons of lippies lying around and you usually have to root through them all to find exactly what you want! Or worse still you have to lug them around in your handbag and they regularly go missing! Nightmare. Since I’m a makeup artist, I need to have all the lipstick colours I have to hand and I found that when I was lugging them around in my kit, they were taking up so much space and I was wasting time trying to read all the lables to see which was which so I came across a method of melting down my lipsticks into a customisable palette which anyone can do quickly and easily with any brand of lipstick. This is a great idea for if you are going on holidays and want to bring all your lipsticks with you but want to save space/weight in your luggage. 6. Some guts to be able to chop up your beloved lippies! 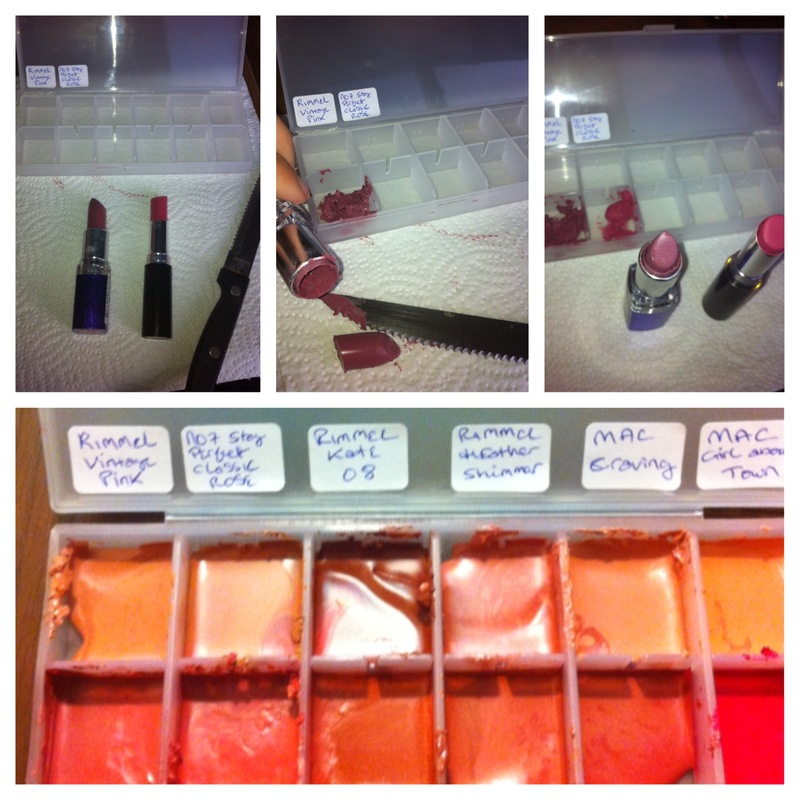 Take your empty plastic palette and which ever lippies you want to use. I would advise that you fill all wells and melt together as it doesn’t work as well if you only half fill and then go back later to add more and melt the lot again. Also put down some paper towels as it gets messy! Cut your lipstick at the base of the bullet with your sharp knife and place the lipstick you’ve just cut, aside. You want to get at the colour that’s in the tube so using the pointed bit of your knife you dig it in and twist until all the product inside the tube comes out, scrape out every last bit and put it into the plastic well of your palette. There’s plenty of product in there and it won’t go to waste which is great! It’s a good Idea to write your labels out and stick them on as you place the lipsticks in, otherwise you’ll forget which is which. When you have taken out all the product that’s inside and the tube is empty, take the bullet that you cut off before and pop it back into the tube. You then still have a working lipstick that you can still use in this way, it will still twist up and down and be the same as it was before. 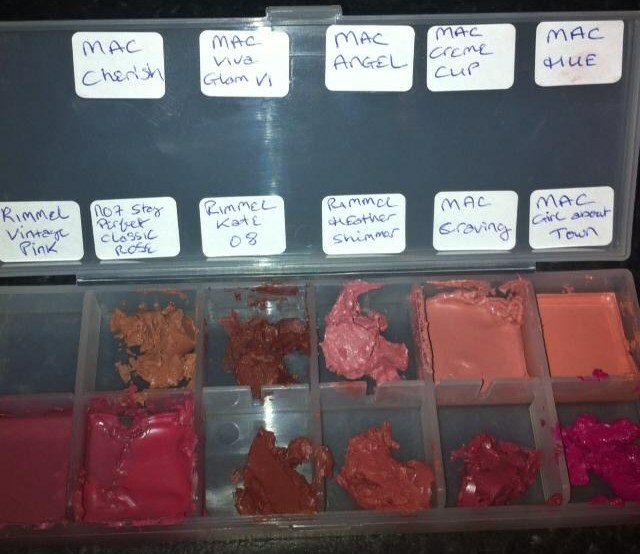 When you have put in all the colours you want and added in all the labels, put your plastic palette into the microwave and heat for 30 seconds. You may find that some brands of lipstick melt slower than others so if they need to go in for another 20/30 seconds then do this. Do not remove your palette from the microwave until the lipstick has set as it will be a runny consistancy and the lipsticks could easily run into each other as mine did if you look closely at the pic! I wish I’d been less impatient so you can learn from my mistake there! Then, you’re good to go and can bring your palette anywhere with you! Muji also do 6 pan palettes if you want a smaller one to carry with you. Then only downside to this, is that you must to use a lipstick brush, as it’s not very hygienic to keep dabbing your finger in to get the product out. But that’s not a hassle, I just use the end of the lipstick brush to scrape a bit out onto the back of my hand and then work the brush into it and apply that way. Then if you want to bring your lipstick out with you for touch ups, you still have the original so it’s all good! Will you have the nerve to try this? Let me know in the comments below! 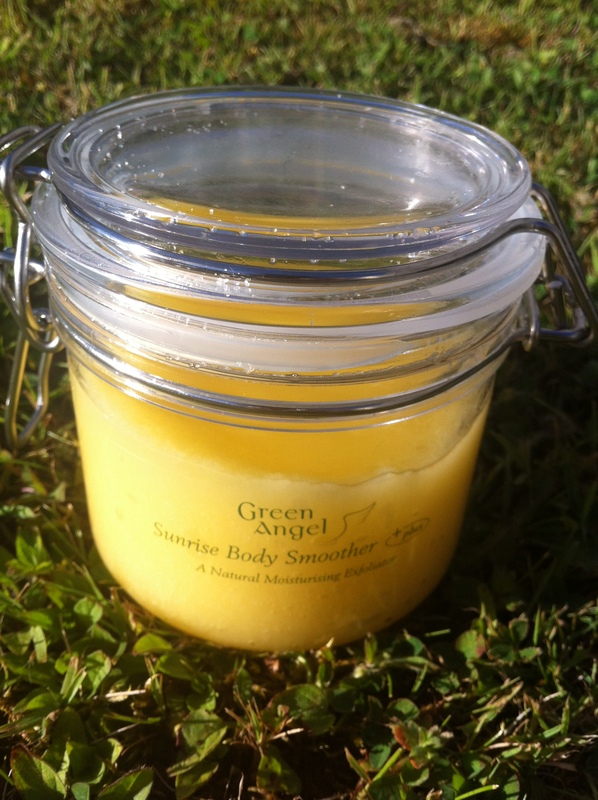 I was sent this gorgeous Natural Moisturising Body Exfoliator to try by Green Angel, an Irish company, which produces a range of natural skincare products. All their products are based around the key ingredient of “Irish Seaweed” which has natural skin rejuvenation benefits and they all smell absolutely amazing which is always a great bonus. 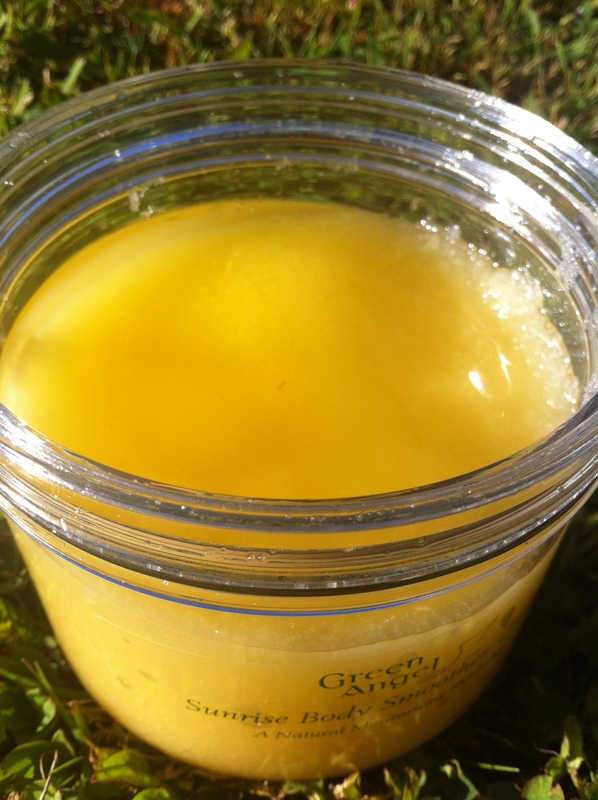 The award winning Sunrise Body Smoother comes in a large glass jar and consists of coarse natural sea salt mixed with lemon, grapefruit, grape seed and argan oil (among other nourishing ingredients) which they claim will exfoliate your skin eliminating dead skin cells, nourishing dry tissue and preserving your skins natural moisture. There is a warning on the box that because of the essential oils, the product is not suitable for pregnant women. The directions on the box also state that the oil can be used for manicure & pedicure purposes by massaging into your cuticles & nails. I used this one evening after a particularly tough session at bootcamp after which I was completely tired and weary and in need of a bit of TLC. I had only opened the box and I could smell the fresh citrus scent so I knew I was in for a treat. Scooping up a small handful I worked the product into my skin starting from my feet upwards and really gave it a good scrub particularly in any particularly dry areas like my knees and my scaly elbows (the result of lots of “planking” at bootcamp!) My skin felt invigorated and fresh and it sloughed off all of the dry skin and remnants of fake tan on there. After showering I could feel the oil on my skin really moisturising it and it felt so soft, also my bathroom smelled absolutely gorgeous and I felt completely refreshed after it! 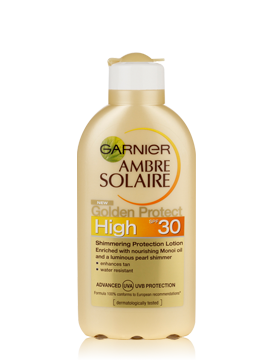 This really is a treat for your skin and I will continue using it, especially before applying fake tan as it does such a great job of preparing your skin for it and getting your body summer ready. Also I transferred some of the oil that had collected at the top of the jar into a separate container and will leave this on my desk at work so I can use it as cuticle oil. There are so many skincare companies out there but the big plus of Green Angel for me, apart from their lovely products, is that they are 100% Irish as well as the fact that the products are paraben free, use natural ingredients and are not tested on animals, so they definitely have a fan in me! 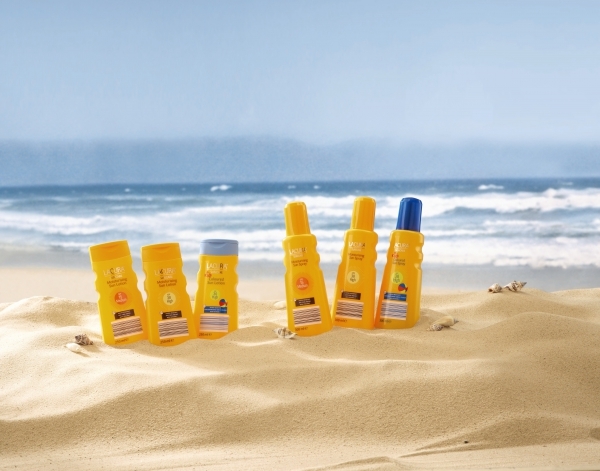 The Sunrise Body Smoother is €30 from stockists nationwide such as McCabe’s Pharmacy or you can check their website http://www.greenangel.com/stockists.html to see if there is a stockist near you. Alternatively you order over the phone and have the product mailed to you. These are a few of the makeup products I’ve been reaching for a lot lately. When the sun starts shining, I love experimenting with new makeup and trying out different colours. Summertime also means you can go a bit lighter with your makeup for a more fresh faced look and wear a pop of colour on your lips! I love wearing this BB cream in the summer, it’s so light on your skin, doesn’t sweat off in the heat and if you’ve got oily skin it’s great for keeping your skin matte all day long. 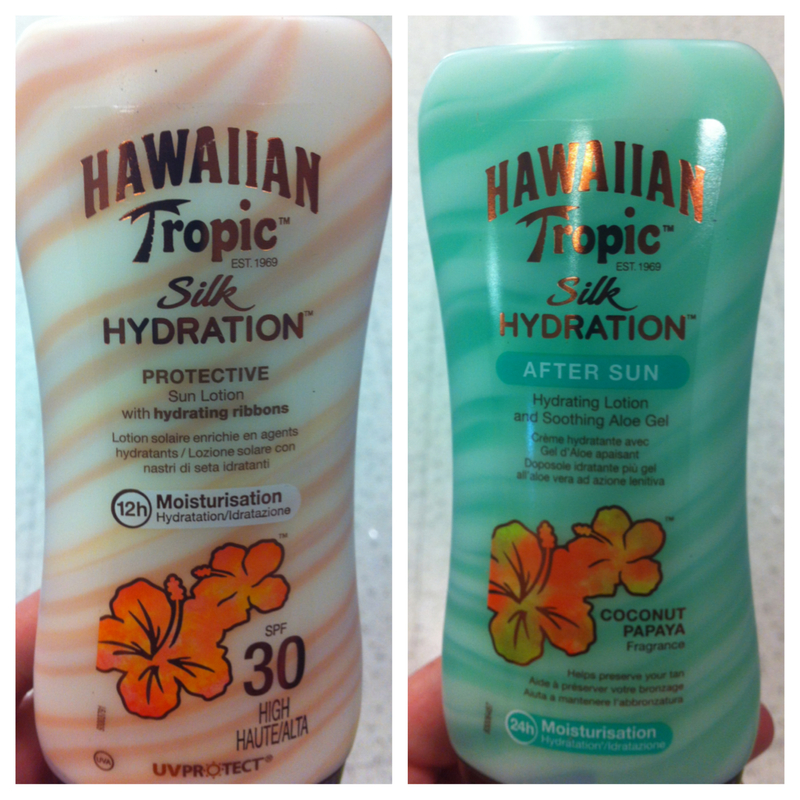 Plus it’s got an SPF of 15. 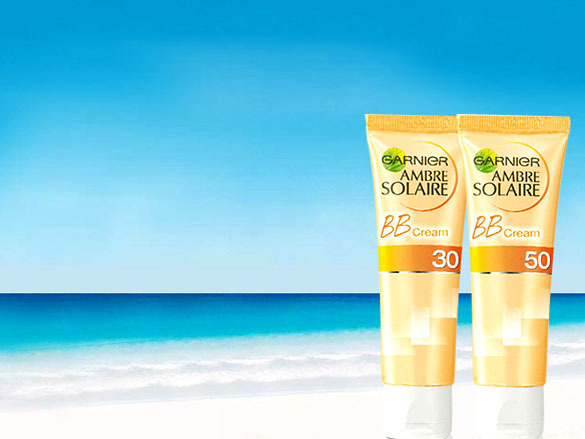 It comes in 2 shades, light and medium and is available in most pharmacies such as boots for around €14. I wouldn’t advise this if you have dry skin as it contains alcohol (and smells quite strongly of it – so don’t slap this on if you’re suffering from a hangover!) which can dry up your skin. This is definitely a summer favourite of mine! 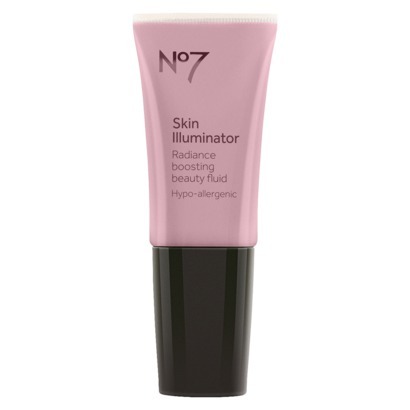 This is a beautiful skin illuminator has an iridescent shimmer which reflects the light and makes your skin look glowing and radiant. 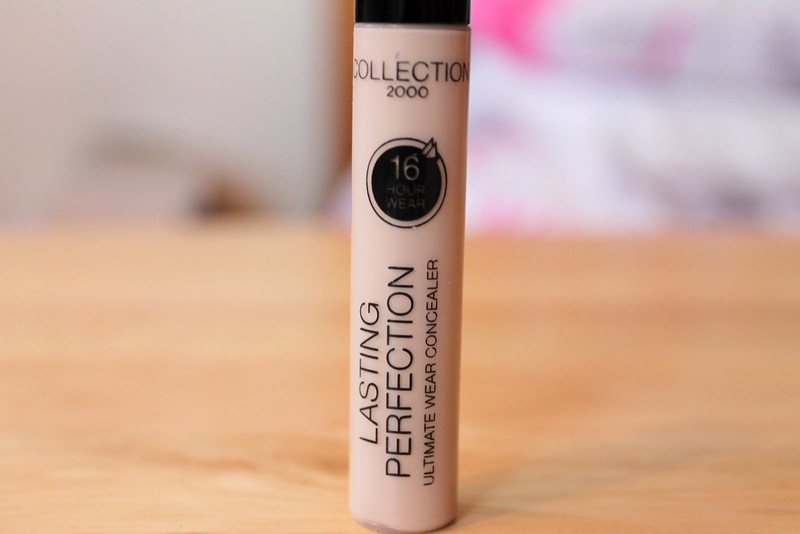 It comes in 2 colours, pink (for paler skin tones) or peach (for darker tones) and has an inbuilt brush which you can use to sweep the product over the tops of your cheekbones, neck or even legs as a highlight or else you can mix a tiny bit in with your regular foundation for a more dewy glowing finish. 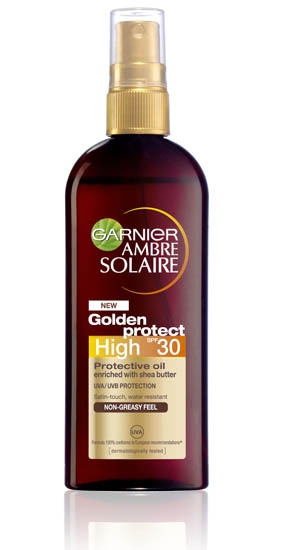 Approximately €13 from Boots. I picked this up one day while doing my shopping, it was only €6 so I though if it turns out to be rubbish I haven’t wasted too much money. Well, I have to say that this is a great little palette, it’s no Urban Decay Naked Palette but it’s certainly not bad for a cheaper brand! There are 6 neutral/brown colours and they all have a slight shimmer, no mattes but they are not overly frosty so great for wearing to school/work/college. Like I say, you really can’t go wrong for €6 so I’m loving this! Ok, so technically this is 6 favourites but I am loving these 2 MAC lipsticks at the moment so had to sneak them both in! 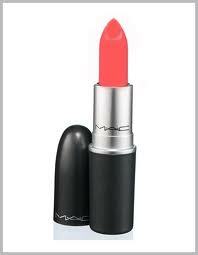 This is just a perfect coral shade for summer and is really stunning on all skintones and looks especially striking on brunettes. I actually got this for free since I had 6 empty containers to bring back to MAC so happy days! 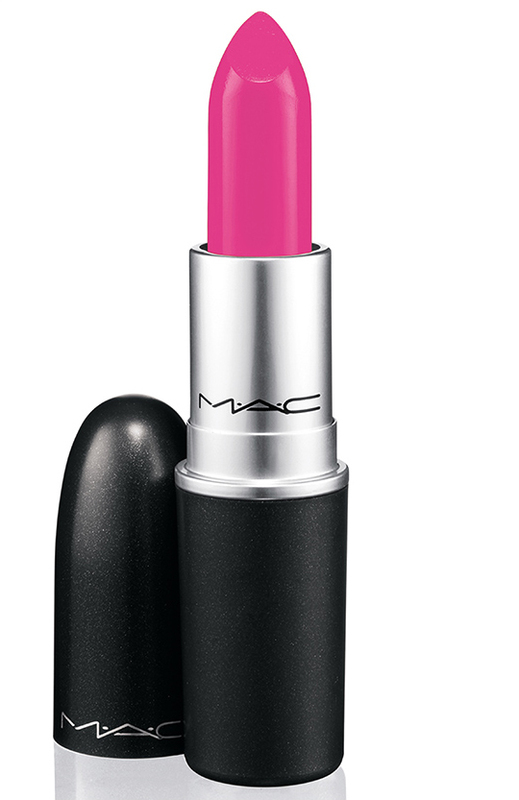 This bubblegum pink lipstick is bright and in your face, not for the faint hearted but it is definitely wearable once you tone down the makeup everywhere else. Light eyeshadow with just a flick of liner would match this lippy perfectly. Gorgeous summer colour!